My father had three uncles and an aunt on his father’s side and they were an important part of his formative years. I met them all as a young child, and my father told me many stories about them. In particular, I remember Aunt Boodie, the wife of his uncle Robert, as an eccentric old lady. She continued to send birthday and Christmas presents to me and my sister until we were in our teens, but they were things suitable for very young children. My father certainly thought she was very eccentric, particularly because she was a theosophist. So in the internet age, I used the power of the internet to research her background, and to contact people who knew about some of her ancestors. And what stories I discovered. A famous poet who committed suicide, a bank robber, and an Indian princess among other things. If I had been researching in the pre-internet days (as recently as early 1990s), there is no way I would ever have discovered some of these stories or contacted descendents with some knowledge of them. 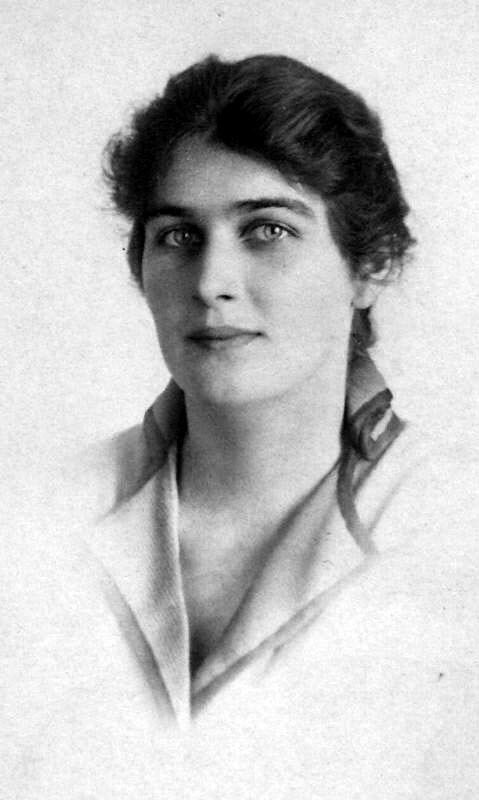 Florence Teasdale Smith (Boodie) was born around 1892 in Melbourne. She was the daughter of George Godwin Crouch Smith and Florence Violet Boake. Florence Boake was the sister of the Australian bush poet Barcroft Henry Boake (1866-1892), who committed suicide by hanging himself with his stockwhip. Boodie had one older brother, Teesdale Boake Smith who was born in 1891 in Melbourne and died on 4 October 1917 in Ypres, World War I at the age 26. 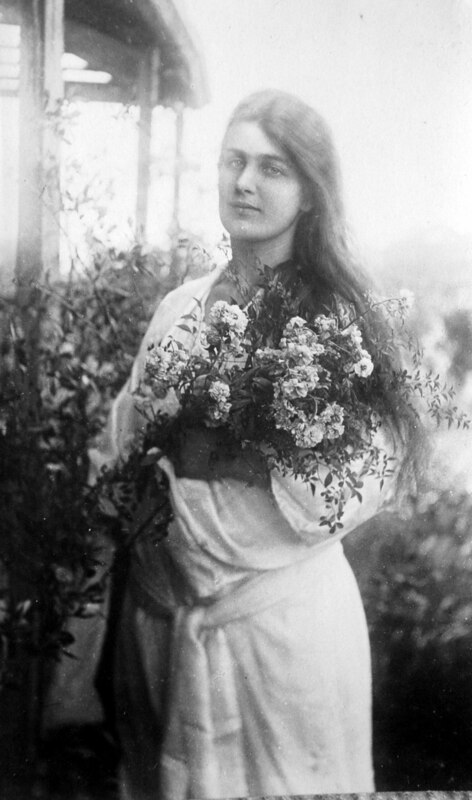 She married Robert Melrose Mathers (1882-1961) on the 7 December 1911, and they had two children Bruce and Barcroft. Bruce and Barcroft were both bomber navigators in the RAF in the Second World War. On his first bombing raid, and his plane went missing on 26 June 1943 over Berlin. Barcroft joined the Pathfinder Squadron in 1941 and a few months before the war ended, he was shot down, captured and sent to Stalag Luft III in Poland, the site of the famous Great Escape. He also escaped and returned to England. Florence Teasdale Smith was usually called Boodie (Aunty Boodie), a name which the family believes probably dates back to her childhood. Boodie and her mother were theosophists. Boodie was a vegetarian who never ate meat and was very beautiful. The family recollected her as being involved in funding the construction of an amphitheatre at Balmoral to watch for the coming of Krishnamurti. Another recollection was that “her money bought a house in Balmoral”. This house was probably “the Manor”, rented in 1922 by the Theosophical Society and bought by it in 1925. It stands in the harbour front street of Iluka Road in Clifton Gardens, and was the home of a community of up to 50 people, led by Charles Leadbeater. I think the family saw Boodie’s involvement with theosophy as somewhat dotty and my father certainly told us the story that she was involved in the building of the Amphitheatre at Balmoral to wait for the arrival of Krishnamurti, who was expected to walk in through the Heads on water. Because of this, I did some research on theosophy in Sydney (which I may post later), and Boodie’s family and ancestors. I was able to trace Boodie’s Boake ancestors back to Quakers who established a Quaker settlement in Ireland during the Cromwellian period, and find out some very surprising information about her father (I think this was unknown to the family and possibly to Boodie). Robert and Boodie lived in a rented house on the corner of Middle Head Road and Kahibah Road when my father was a boy (the house is still there). Sometime after the war, Robert and Boodie bought a house in Artarmon on the corner of Hampden Road and Barton Road (there is now a block of units there). 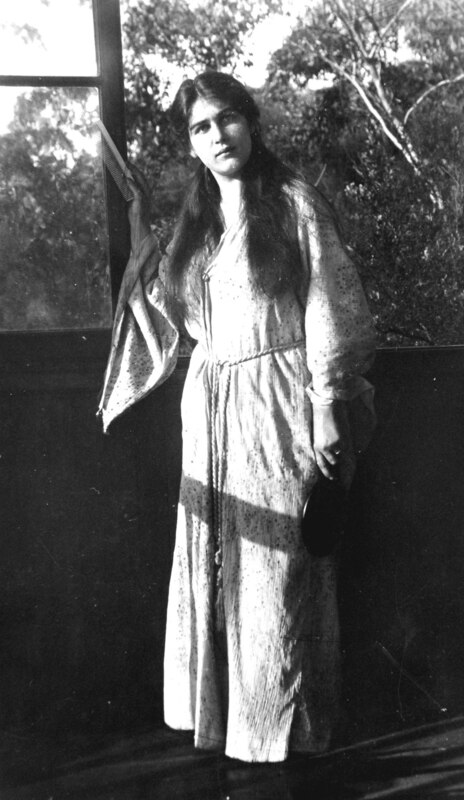 After Robert died in 1961, Boodie sold the house and lived in Warrimoo in the Blue Mountains until her death in 1965. Bank robbery, murder and suicide. The story was also reported in the New York Times of 27 November, 1897, though it had a somewhat different version of the events, in which the teller was supposed to have had his neck broken. This is perhaps because the New York Times reported on the same day, and the bullet wound to the teller was not discovered later, when his body was examined closely. A report published in a local newspaper4 gave a much more definitive account and some background to this tragic event. Apparently George Godwin Crouch Smith was unemployed and unable to support his family and travelled to South Africa seeking work. He stayed at a boarding house for about four months, but was unable to find work. While there he showed his landlady in South Africa “a beautifully framed large photo which contained an exquisitely tinted picture of Mrs. Smith and her three children. The wife of the desperate man appears to be a beautiful blonde about thirty years of age with handsome features, while the children, a boy of about ten and two girls about eight and six respectively, are very attractively portrayed. ” Perhaps the landlady’s recollection of the photo is not exact, since the Victorian birth records record one sister (Boodie) and three brothers, the last of whom was born in 1897 – possibly after George had left Australia. 60, Buitengracht Street, Cape Town, November 26, 1897. If you get this letter I will have ceased to be. Do what you can for my little wife and darlings that I will never see more in this world or the next. My policy is for £400. For this disgrace forgive me: I have got on the wrong tack, have no money and have no chance of making it honestly. It is because of my loved ones I am doing what I am doing. Had a letter from V. today that gave me some idea of the trouble she has been in and will be in. If I had only myself I would struggle on, but cannot live to think that by my living they are in poverty and trouble. One more, if you can, forgive and forget me. For all your love in the past and all you will do in the future, if you will, accept my thanks. When the police arrived at the bank, George fired the last shot in his five-chambered revolver at his own head. It was afterwards found that the bullet had entered just above the nose and centrally between the eyes and buried itself in his forehead. He was taken to a cell in the Police-station, where he got medical attention and then was moved to the Gaol Hospital at Wynberg.. The next morning, he was in a semi-conscious condition for a few moments. The doctor asked him if he wished to send a message to anyone. Smith replied in the negative and went on to say “I suppose this is my last bulge.” Smith then said he thought he was going to die, and on being asked if he would like to see a minister, said “Yes”. A Church of England clergyman shortly afterwards visited the man, who, however, by that time was again unconscious and could not say or understand anything. The following day, several pieces of bone were taken from Smith’s head, leaving a very large wound. The doctors thought that recovery would be impossible and George Godwin Crouch died late that day, two days after the events at the bank. No doubt Florence knew what George had done, but whether she told her children is unknown. Certainly, it was never mentioned by my father and I remember him reminiscing about Boodie at some length. If she knew, I doubt she told any members of the Mathers family, but it is entirely possible she did not know. 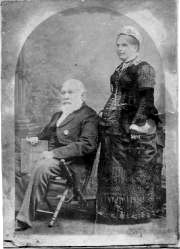 Boodie’s paternal grandparents were George William Smîth (1813-1892) and Ellen Teasdale (1824-1895). George, known as “Bombay” Smith, was born in 1813 in Cochin, South West India, the son of a British Army officer, Capt. William Stewart Smith (1787-1823) and Wilhelmina Ernestina Liebschwager (1795-1870). George married Ellen Teasdale in Bombay in 1840 and they migrated to Australia in 1852. Ellen went back to Bombay and died in 1895 after her husband George passed away in 1892. This put further pressure on George Godwin the baby of the family, and probably contributed to his depression. 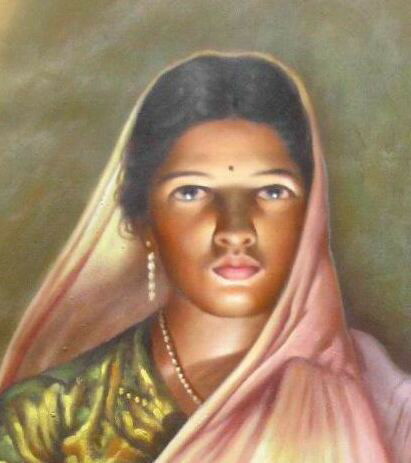 Ellen was born in Dapoolie, Hindustan, India in 1824 and was an Anglo-Indian. She was the daughter of Major Henry Crawshay Teasdale, who was killed in the Battle of Miani, India in 1843, and Princess Budhson (or Bakshan), daughter of the Maharaja of Satara. The princely state of Satara in central India was founded in 1674 by Shivaji the Great (1627-1680) and ruled by the Bhonsle dynasty (who also provided the rulers of the states of Chittor and Udaipur) from then until it was annexed by the British Raj in 1848. Until the 19th century what is now India (like Europe) was a patchwork of over 650 princely states, like kingdoms, ranging from the small and relatively unimportant, to the large, immensely wealthy and powerful, ruled over by men (mostly) with a wide range of titles in addition to the familiar maharajahs and rajas. Princess Budhson was the daughter of Raja Shahu II Bhonsle (1763 – 3 May 1808), who was the titular Chhatrapati (emperor) of the Maratha Empire, and his third wife Rani Shrimant Akhand S Gunwatabai. Shahu II was born Vithoji Trimbukji Raje Bhonsle and was the son of Shrimant Sardar Trimbukji Raje Bhonsle of Wai (or Wavi)4,5. Shahu II was the adopted son of the previous Maharaja, Rajaram II, and succeeded on the death of his adopted father, on 11th December 1777. Under an ancient Hindu custom, to avoid a disputed succession to the throne, a ruler with no born-to heir could adopt a male of any age from another branch of the ruling family and appoint him heir apparent. This parallels similar customs in ancient Rome and during the Chinese Qing Dynasty. When the British took control of India, they invented the Doctrine of Lapse, under which they could veto the right of succession of an adopted heir and annex the territory. Shahu II reigned as a virtual prisoner under the control of the Peshwa, his Prime Minister and nominal servant, until his death in 1810. Shahu II was succeeded by his son, Maharajah Pratapsinh. The Maratha Empire was broken up at the end of the Third Anglo-Maratha War (1817–1818). This was the final and decisive conflict between the British East India Company and the Maratha Empire in India. The war left the Company in control of most of India. It began with an invasion of the Maratha territory by 110,400 British East India Company troops, the largest such British controlled force massed in India. British victories were swift, resulting in the breakup of the Maratha Empire and the loss of Maratha independence. The Maharaja Pratapsinh of Satara was restored as the ruler of his territory as a princely state, under the thumb of the British, but was deposed by the British and sent into exile in 1839. The next raja … Shahaji III (1802-1848), was another adoptee and was a brother of Shahu II. On his death in 1848, the Doctrine of Lapse was invoked by the British, to veto the succession by his adopted son, and fully annex Satara. 1. Ballarat & District Genealogical Society. Digby pioneers of South West Victoria. http://www.ballaratgenealogy.org.au/digby/family/smith_geo1816.htm (acceessed 29 Sep 2009) . 2009. 2. Bank robbery, murder, and suicide. Bay of Plenty Times XXIV, 2-2 (http://paperspast.natlib.govt.nz/cgi-bin/paperspast?a=d&d=BOPT18971201.2.10.4 accessed 10 Oct 2010) (1897). 3. Startling Tragedy. Desperate To Rob A Bank At Claremont. Plucky Conduct Of The Manager. A Young Clerk’s Pathetic Death. Suicide Of The Miscreant. Cape Times Weekly Edition, December 1, 1897. 4. The Battle of Miani (or Battle of Meeanee) was a battle between British forces under Sir Charles Napier and the Talpur Amirs of Sindh, of today’s Pakistan. The Battle took place on 17 February 1843 at Miani, Sindh in what is now Pakistan.The primary reason for the battle was the ambition of Sir Charles Napier. Around 5-6,000 of the Talpur army of 8,000 were killed, with an estimated 256 British casualties. This entry was posted in Mathers family history and tagged ancestry, Barcroft Boake, Bhonsle, Boodie, family history, Genealogy, Maharaja, Mathers family history, Satara, Shahu II, Teasdale by colinmathers. Bookmark the permalink. Another descendant who contacted me told me that Henry’s Indian wife was named “Bakshan”. So I have three variant spellings for her name Bhudson, Buh’Hson and Bakshan. Probably someone familiar with the culture of that region could tell me what the most likely form of the name was. A google search for each of these names (plus Satara) got hits only for Bakshan. So that perhaps is the correct form of the name. Major Teasdale’s parents were Richard Teasdale (born 1774) and Mary Ann Burrows. Richard’s parents were Cuthbert Teasdale (d. 1781) and Anne West, who married 07 Sep 1766 – Whitley (near Hexham), Northumberland, England. Reference (1) “India, Births and Baptisms, 1786-1947.” Index. FamilySearch. http://FamilySearch.org : accessed 2015. Index based upon data collected by the Genealogical Society of Utah, Salt Lake City. I started reading this post because my spouse had a Great-Aunt Boodie, so I was hooked to read more. What a fascinating story! Thank you so much for sharing this interesting lady’s life and background! 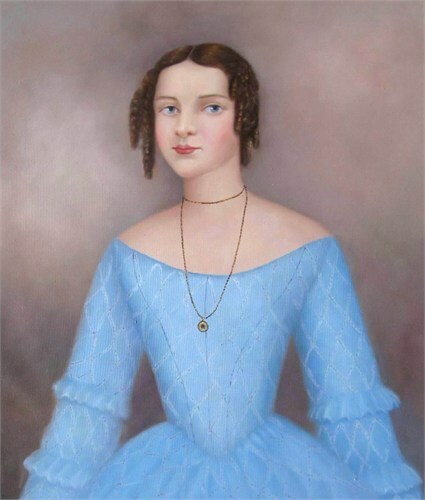 I’ve just come across this thread and haven’t had time to really go through it but I thought I’d chip in as I’m one of Ellen Teasedale’s great great granddaughters through her daughter Georgina who married George ‘Bombay’ Smith. I’ve got pictures of Ellen, Ellen’s daughter Georgina, Georgina’s daughter Saide (named after Port Said), and Saide’s daughter Elizabeth (my mother) if anyone is interested in having copies. Colin – Could you let me have your email address please or tell me another way I can attach the photos for you? Four pictures – two pages. I would very much like to have a copy of your photos please for my Matthews – Teasdale family tree. You can see my connection to the Mathers family on the replies page and do get in touch if you wish to know more about my Matthews family. Hi, I am trying to find out the relationship between George Barcroft Teesdale Smith (born 1889)who married Sylvia Sadie Timms in 1915 before he shipped out to fight in WW2 and the other Teesdale Smiths. All of his three sons had the middle name of Barcroft Teesdale so it seems there must be a strong connexion. Sadie Timms’s father, Joseph, was in business with Henry Teesdale Smith. The letter from his brother in South Africa was sent to the offices of Smith and Timms. I am writing a fictionalised book about Sadie, the third in a series about her family. I believe George’s parents were called George and Hilda Margaret. I would be grateful for any clues at all. Thanks for reading. I am interested in why , how and when the family TEASDALE surname was changed / became TEESDALE ? Rosemary, I have your George Barcroft Teesdale Smith in my family tree as the brother of Florence Teasdale Smith (my Aunty Boodie) but with the name Barcroft George Teasdale Smith (1899-1927). Their parents were George Godwin Crouch Smith (1866-1897) and Florence Violet Boake (1869-1943). If you look at my posts on Auntie Boodie and on her ancestor Princess Buh’son (indian princess) you will see some of the history. I have traced the name Barcroft back to a Quaker settlement in Ireland in 1600s and maybe I will post that story sometime. His mother was also the brother of Barcroft Boake who was a famous Australian bush poet who committed suicide in his twenties. There is quite a bit on the web about him, but I have done a summary which I will also post here. However, the most extraordinary story is that of his father George which I discovered quite by accident. I’ve summarized it in the story on Boodie’s Indian ancestors here.